Have a Super Mario Easter! I love the Easter holiday. I enjoy both the religious and secular sides of it. So I was thrilled to find some Mario related Easter treats at the store. So let’s take a look at what I’ve found. Jump Force and Cup Noodles Team Up! Around this time last year, I wrote a short article about how Cup Noodles ramen was doing a promotion with the fighting game Dissidia Final Fantasy NT. Well they’re doing the same thing again this year but for a different game: Jump Force. It’s a 3-D fighting game featuring various anime characters, so let’s take a look at this cross promotion. Crocs, Climbers, and Carnivorous Plants, Oh My! I got a new batch of amiibo figures recently. These include two of the newly added characters to Super Smash Bros. Ultimate, as well as one returning from a previous game in the series. So let’s take a look at them! Even though I mostly write game reviews, I’ve also written reviews on gaming accessories ever since my days at The Dallas Morning News more than 20 years ago. And I think the Sennheiser GSP 550 gaming headset is probably one of the most high end headsets I’ve ever reviewed. So if you do a lot of PC gaming and take it very seriously, you may want to check out this review and see if this headset is right for you. No office desk is complete without a desk toy to help you through the slow times of the day. For anyone raised in the heyday of video game arcades, the folks at My Arcade are there for you. They offer a line of nostalgic classic videogames in realistic arcade cabinets that are small enough to fit on one’s desk. 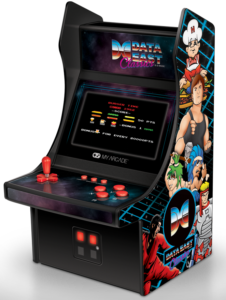 Some of the biggest names in early arcade history are available in a handheld portable Pocket Player, as a 7” tall arcade-shaped Micro Player, or the top-of-the-line 10” tall Data East Mini Player. Sure, they’re fun to play, but I get a smile simply seeing it there on my desk. Cary’s Best Games of 2018 Awards Show! It’s that time of year again! It’s the Cary’s Best Games of 2018 Awards Show blog! Keep in mind that no outside opinions went into the making of this list. It’s just my own picks. And if a game is missing from my list, it either didn’t appeal to me as much, or I just simply haven’t played it yet. Can’t play all the games out there, you know!